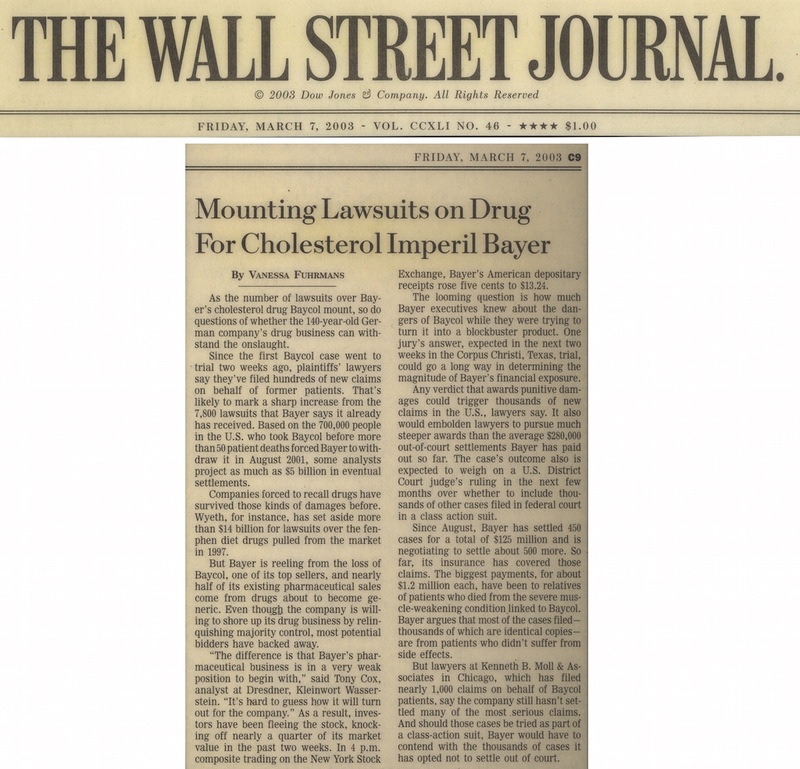 As the number of lawsuits over Bayer AG's cholesterol drug Baycol mount, so do questions of whether the 140-year-old company's drug business can withstand the onslaught. Since the first Baycol case went to trial two weeks ago, plaintiffs lawyers say they have filed hundreds of new claims on behalf of former patients. That is likely to mark a sharp increase from the 7,800 lawsuits that Bayer says it already has received. Based on the 700,000 people in the U.S. who took Baycol before more than 50 patient deaths forced Bayer to withdraw it in August 2001, some analysts project as much as $5 billion (4.56 billion euros) in eventual settlements. Firms forced to recall drugs have survived those kinds of damages before. Wyeth, for instance, has set aside more than $14 billion for lawsuits over the fen-phen diet drugs pulled from the market in 1997. But Bayer is reeling from the loss of Baycol, one of its top sellers, and nearly half of its pharmaceuticals sales come from drugs about to become generic. Even though the German company is willing to shore up its drug business by relinquishing majority control, most potential bidders have backed away. "The difference is that Bayer's pharmaceutical business is in a very weak position to begin with," said Tony Cox, analyst at Dresdner Kleinwort Wasserstein. "It's hard to guess how it will turn out for the company." As a result, investors have been unloading the stock, knocking off nearly a quarter of its market value in the past two weeks. In Frankfurt trading, shares rose 11 European cents to 12.13. The looming question is how much Bayer executives knew about the dangers of Baycol while they were trying to turn it into a blockbuster product. One jury's answer, expected in the next two weeks in a Corpus Christi, Texas, trial, could go a long way in determining the magnitude of Bayer's financial exposure. Any verdict that awards punitive damages could trigger thousands of new claims in the U.S., lawyers say. It also would embolden lawyers to pursue much steeper awards than the average $280,000 out-of-court settlements Bayer has paid out so far. The case's outcome also is expected to weigh on a U.S. district-court judge's ruling in the next few months over whether to lump thousands of other cases filed in federal court in a class-action suit. Since August, Bayer has settled 450 cases for a total of $125 million and is negotiating to settle about 500 more. So far, its insurance has covered those claims. The biggest payments, for about $1.2 million each, have been to relatives of patients who died from the severe muscle-weakening condition linked to Baycol. Bayer argues that most of the cases filed -- thousands of which are identical copies -- are from patients who didn't suffer from side effects. But lawyers at Kenneth B. Moll & Associates in Chicago, which has filed nearly 1,000 claims on behalf of Baycol patients, say the company still hasn't settled many of the most serious claims, such as those involving the death of a patient. Should those cases be tried as part of a class-action suit, Bayer would have to contend with the thousands of cases it has opted not to settle out of court. Since the Texas trial began, plaintiffs lawyers have disclosed dozens of company documents, including e-mails and memos of Bayer executives weighing how to deal with increasing reports of Baycol's troubling side effect, a rare muscle disorder called rhabdomyolisis. The painful condition can lead to hospitalization and kidney failure if untreated. More than 100 Baycol users died from the disorder. Many of the documents are just snippets of e-mail exchanges that don't provide the full context of discussions. But lawyers have used them to paint a picture of company officials playing down early signs of trouble or worrying about uncovering how many more Baycol patients were falling prey to rhabdomyolisis than people on competing cholesterol drugs. The documents show that executives were aware that Baycol triggered a higher rate of rhabdomyolisis before Bayer sought regulatory approval for a higher dose in 2000, more than a year before it was withdrawn. Bayer has said that most of those cases happened when Baycol was taken with another drug, gemfibrozil, and the drug company added a warning label in December 1999 that gemfibrozil was not to be taken in combination with Baycol. It wasn't until after approval for the higher dose of Baycol that Bayer and the U.S. Food and Drug Administration noticed a sharp increase in rhabdomyolisis cases when not taken with gemfibrozil, the company said. Lawyers for Bayer have said company officials reported every adverse event, as reports from doctors of side effects or other drug complications are called, to the FDA as required. "We sent them in often in advance of the due date," said Philip Beck, who is representing Bayer. Lawyers for both sides expect to give their closing arguments in Corpus Christi by the end of next week.